An unreleased BlackBerry 10 device has been caught at Geekbench benchmarks. It's listed as 'Ontario' in the Geekbench benchmark testing. If you're not familiar with the Geekbench app you should know that it is a pretty popular processor benchmark application that's used for benchmarking your device. And it's looking as though someone at BlackBerry decided to try it out with a still unreleased "Ontario" smartphone. As we can see by looking at the results above, the Geekbench test result suggests this smartphone will run a version of BlackBerry OS 10.3. And we're looking at it running a Qualcomm's powerful Snapdragon 800 quad-core chip and 2048 MB of RAM. It's unclear whether it could be launched later this year or even during the forthcoming Mobile World Congress at the end of this month, but with this report it apparently tell us that someone in Waterloo is still testing it and BlackBerry OS 10.3 is being worked on. 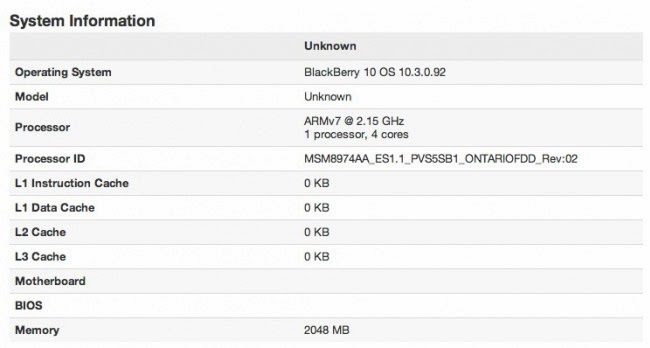 0 comments on "BlackBerry "Ontario" with OS 10.3 spotted at Geekbench benchmarks"